I have a running joke with a friend from the States, that all us Brits do is sit around having tea and crumpets (which is obviously not true). This post however, is very stereotypically British. Seeing as it’s the Queen’s Jubilee and all, I think it’s allowed. I bet there will be a lot of tea drinking and crumpet eating and possibly some scones too. Well, don’t go out and buy scones, make them yourself! Here is a recipe for scones that your can use. It’s really quick and easy and you don’t really need any fancy baking equipment or ingredients. Mix the flour salt and baking powder together in a large bowl. Add the butter and rub it in with your fingers until the mixture resembles fine crumbs. Then stir in the sugar. Heat the buttermilk for 30 seconds in the microwave. Stir the vanilla extract into your buttermilk (see note below on how to make buttermilk using regular milk & lemon juice/vinegar). 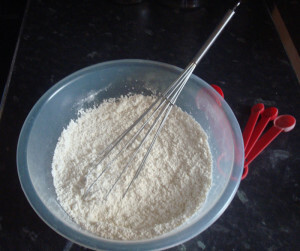 Make a well in your flour mix, pour the buttermilk into the well and mix quickly using a knife. Sprinkle some flour onto a work surface and tip your dough out (the dough may seem a bit wet/sticky at this point). 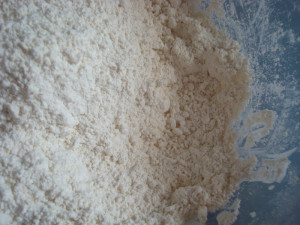 Put some more flour over your hands and the dough and fold the dough over a few times until it is a bit smoother. Pat the dough into a circle shape that is approximately 4cm deep. 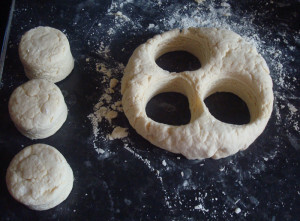 Then using a 5cm cookie cutter or a glass, that’s been dipped in flour, cut circles out of the dough. You may need to push the dough back together in order to use it all up. Brush the tops of your scones with a beaten egg and pop them onto your hot baking tray. Bake them in the oven until they’ve risen and the tops have turned golden, about 10 mins or so. You can eat them just warm out of the oven, or wait for them to cool and have them with some jam and a bit of double cream that’s been whipped with a whisk. *To make your own buttermilk, add 1/2 tablespoon of white vinegar or lemon juice to 175ml of regular milk. Stir and leave for 5-10mins. The milk should look slightly curdled. The acidity of the buttermilk really helps the scones to rise better. You can find ready-made buttermilk in most supermarkets, usually located next to the fresh creams. 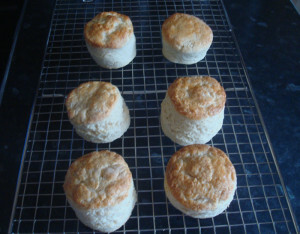 Will you be making these scones over the Jubilee weekend? Let me know how you get on! Most importantly, have a lovely long bank holiday weekend.